Flexible Molybdenum Foil substrate has a lightweight and stable physical and mechanical property. At present, flexible metal substrates, such as aluminum foil and stainless steel, are not the best choice. This is because the thermal expansion coefficient is very high. However, those flexible metal substrates are comparatively cheaper. Molybdenum Foil has its advantages. For example, Molybdenum Foil has high mechanical and thermal stability. However, the disadvantage of Molybdenum Foil is that Molybdenum Foil needs to add an insulating layer between the metal substrate and Molybdenum back contact. Molybdenum back contact, the effect of Molybdenum diffusion on the battery performance cannot be ignored. Therefore, the focus is still on reducing the temperature of the deposition process under the assumption of ensuring the quality of film. Molybdenum Foil substrate needs to has adequate strength and sufficient wet resistance. The thermal expansion coefficient of Molybdenum Foil substrate can’t be too different from that of other films, such as the thermal expansion coefficient of Molybdenum back contact. Otherwise, during the process of rising and cooling for many times, the assembly film is easy to fall off. 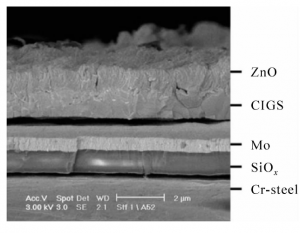 In addition, the substrate doesn’t only serve as the main load-bearing structure of the solar cell device but also serve as a substrate to insulate functional films from the external environment. Therefore, the substrate can protect the battery from external water, oxygen and other factors. The advantages of thin film solar cells include low manufacturing cost, large area continuous production. It also can be made into flexible and roll shape. Compound CdTe thin film solar cell has high photoelectric conversion efficiency, low cost and easy to scale production. CIS, CIGS, CZTS thin film solar cells have the advantages of low cost, high efficiency, stable performance and so on. Therefore, CIS, CIGS and CZTS films have become the focus of photovoltaic industry research in recent years. CHEMETAL USA is a leading molybdenum supplier and manufacturer in worldwide. To learn more information about molybdenum foil, please check our homepage.